"Succession & when it's time to let go"
This blog entry with the Harvard Business Review discusses the three phases of a CEO's lifespan and what happens when leaders outstay their time and performance starts to decline, to the detriment of the company and to the incoming successor. Leadership programs can help out-going leaders reduce the anxiety of retirement and prepare them for a graceful exit. "How would you like to be remembered?" How would you like to be remembered? What would you like to be your epitaph? Thoughts about our legacy can influence our life’s trajectory. Consciously or unconsciously, they impact our life’s choices. Thinking about how you would like to be remembered can be a catalyst for radical change. "The retirement syndrome & challenges of letting go"
This article analyses a problem that can be described as the retirement syndrome. In exploring the difficulties many leaders face in letting go at the end of a full career, reviews a number of the barriers to exit and provides suggestions as to how individuals and organisations can develop more effective and humane disengagement strategies. "Death anxiety and executive mortality"
This blog entry with the Harvard Business Review explores the death anxiety and what happens when we repress our fear of death and refuse to confront it. "Aging and quality of life"
This working paper deals with a rather taboo subject: the consequences of prolonging life into extreme old age, now possible with advances in medical procedures. "For many executives walking away can be the hardest part of the job"
As a leader you need to focus on your successors early in the game. Doing so will not only underpin the long-term sustainability of your enterprise, it may give you a shot at immortality. "Psycho- dynamic factors & succession in Russia"
This article examines some general psychodynamic factors that influence the succession process in Russian businesses. 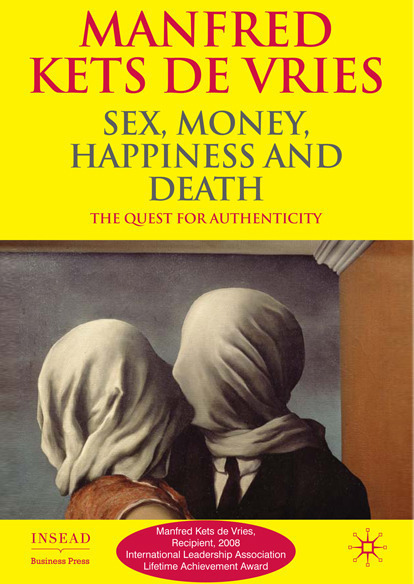 Manfred Kets de Vries takes readers out of their comfort zone in this book. It intends to focus executives on what really counts in their lives and to shake academics down from their ivory towers and make them more attuned to the real problems of real people, instead of trying to impress each other. Once you have it all, what's next? Where to look for answers to the existential questions many of us grapple with.